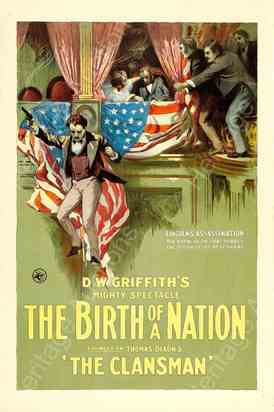 DALLAS - A one sheet poster for D.W. Griffith’s 1915 epic The Birth of a Nation - considered to be one of the most controversial and explicitly racist films of the early 20th century - sold for $74,687 to an HA Live! bidder for more than three times expectations in Heritage Auctions’ summer Vintage Movie Posters Auction. The July 30-31 auction realized more than $1.7 million, with top prices paid for pre-War horror posters and uncommon discoveries for classic American films. Posters from horror films proved popular as a rare one sheet for 1939’s sequel Son of Frankenstein, starring A-listers Boris Karloff, Bela Lugosi, and Basil Rathbone, sold for $43,020 and a one sheet for Universal’s 1939 classic Dracula’s Daughter sold for $35,850. A one sheet for The Mummy’s Hand brought $14,937. Multiple bidders vied for rare paper from Hollywood classics, including one of just a handful of one sheets known to exist from the 1930 film Morocco, starting Gary Cooper and Marlene Dietrich. The bright stone lithographed copy - which marked Dietrich’s America movie debut - sold for $40,630. A one sheet for The Bell Boy, the 1918 film starring cinematic comedy giants Fatty Arbuckle and Buster Keaton, sparked a bidding war among 10 people to blow past it’s $3,000 pre-auction estimate to sell for $35,850. Unusual discoveries sparked intense bidder interest as a scarce insert format poster for the iconic Casablanca sold for $33,460 and a set of three Italian premier display posters for 1966’s The Good, the Bad and the Ugly - measuring an amazing 39-inches by 110-inches - sold for an astounding $31,070 against an $18,000 estimate. Famed poster artist Drew Struzan’s original acrylic painting for the one sheet used for Cannonball Run II sold for $21,501. Want to get the up-to-the-minute updates and breaking news stories about Heritage Auctions? Get them as they happen at: HA.com/Twitter; Facebook: HA.com/Facebook. To view a complete archive of Heritage press releases go to: HA.com/PR. To link to this press release on your blog or Website: HA.com/PR-2982.